This page is, like others, on a best endeavours basis. Correctiona and additions will be gratefully used. 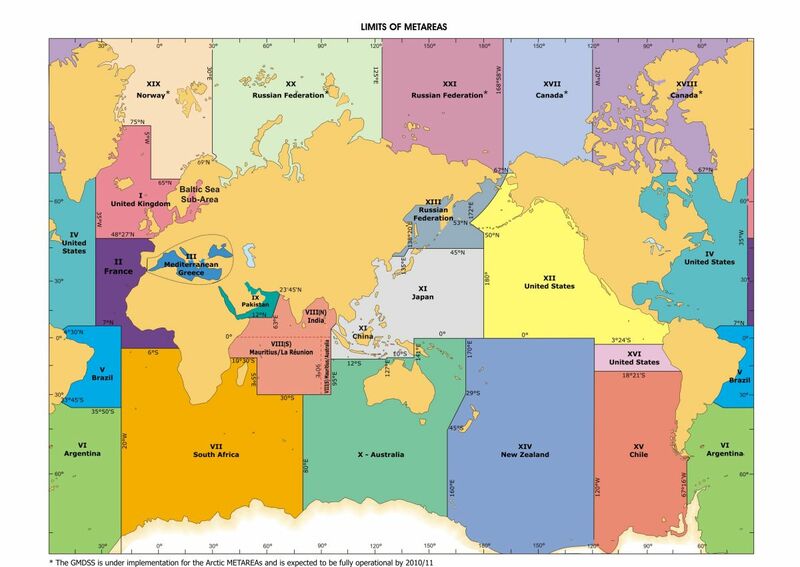 For navigation and weather forecasting purposes, the world is divided into 21 NAVAREAs or METAREAs , the terms are interchangeable. High Seas forecasts for these areas are broadcast on one or more of Inmasat-C, HF/SSB or NAVTEX . Texts of these forecasts ans some NAVTEX messages are available on the JCOMM (Joint technical Commission for Oceanography and Marine Meteorology) website. A problem with this site is that the links to forecasts cannot be bookmarked. When bandwidth is limited, High Seas forecast can be obtained by email using the MailASail text responder. Send a blank email to weather@mailasail.com. In the subject line type metareaX.txt where X is the METAREA number 1 to 16. This page gives URLs that can be bookmarked, where available, for High Seas and many other forecasts. 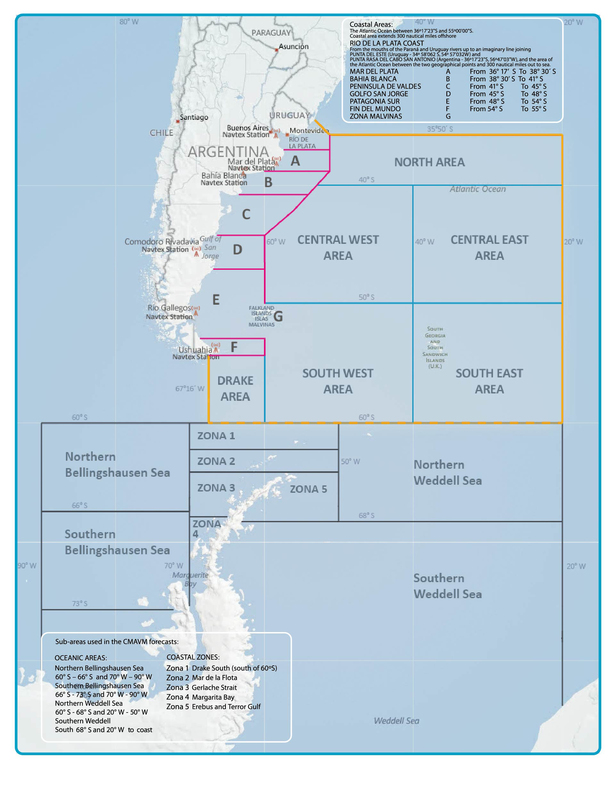 Most can be obtained using the Saildocs text retrieval facility. Those that cannot be so used are marked with an *. A browser is then the only option. Canadian Waters menu - offshore and coastal forecasts. USA Marine forecast menu - Ocean, Coastal, Inshore waters including the Caribbean and NAVTEX broadcasts. NB. URLs in these two latter pages can be bookmarked and used with text retrieval. Around Curacao - 48 hours. For these areas, 5-day forecasts. All US sea areas � can be used to download forecast texts. METAREA 6 � Brazil/Uruguay border to the Antarctic. Coastal forecasts La R�union, menu. Qatar coastal waters* This is not a reliable link. METAREA 10 South Indian Ocean, Southern Ocean 141 to 170 degE, Australian waters. Email request One message covers all. The following are �menus� for various areas. JMA forecasts menu Individual areas can be book-marked and retrieved by email. USA Marine forecast menu - Ocean, Coastal, Inshore waters including NAVTEX broadcasts. All US sea areas � can be used ti download forecast texts. High Seas on the JCOMM page. Pacific High Seas* Area from 25S to 55S and 170W to 120W. Pacific N Tropic High Seas* Area 25S to 40S, western boundary from 40S 163E to 29S 170E then to 25S 170E, eastern boundary 170W. Pacific Area Forties* Area 40S to 55S, western boundary from 40S 163E to 45S 160E then to 55S 160E, eastern boundary 170W. Pacific Southern* Area from 55S to southern ice edge between 160E and 120W. Hawaiian Offshore waters 40 - 240 nm. Both of these Canadian sites give URLs that can be saved and used for email text retrieval. The US NWS Ocean Prediction Center - a source of much useful oceanic and Arctic information. zyGrib is the most used But now replaced by a fork - XyGrib. Saildocs email GRIB service the most flexible and most economic with limited bandwidth. If this is too complex, use the Weather4D app to generate email request messages. All provide the GFS, some give alternatives. A variety of services Links to many GRIB type services from national meteorological services and commercial sources.